Hands up if you’re excited about MWC! Looks like Sony Ericsson is gonna have a busy time out there with more apparent leaks of upcoming devices.. Perhaps the last Xperia models to rock the ‘ href=”http://www.ericsson.com/” rel=”homepage” target=”_blank” title=”Ericsson”>Ericsson‘ bit in their names too. This group photo has surfaced showing the Xperia line and there appear to be two strangers making an appearance. 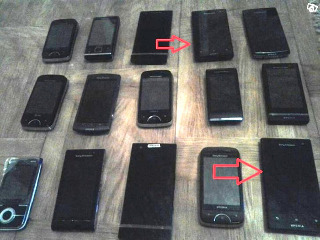 GSM Arena reckons that the bigger one at the bottom is the Xperia Nypon whilst the smaller one at the top could very well be the Kumquat. Specs wise, the Nypon us a NovaThor U8500-based handset and gives us href=”http://www.sony.com/” rel=”homepage” target=”_blank” title=”Sony”>Sony‘s fantastic qHD Reality display (4-inches in this case) with a fairly respectable, but no longer massively adventurous 8MP snapper and 1080 HD video recording. The Kumquat, meanwhile, is also rocking a NovaThor U8500 chipset but has more parred down specs. For example, the screen is 3.5-inches and FWVGA whilst the camera is 5MP with 720 video recording. That’s assuming it is the Kumquat and not the Xperia Pepper. Oh well.. only a few more weeks until we find out. And you can guarantee there will be more leaks between now and then!